2018 is the second year of the student Council at Caludon. We have already enjoyed a very successful campaign drive and election process with over 60 students applying to become candidates. We pride ourselves in a fully inclusive and robust election process reflecting the real life election process including promotional events such as the student hustings and campaigns ran by the candidates. 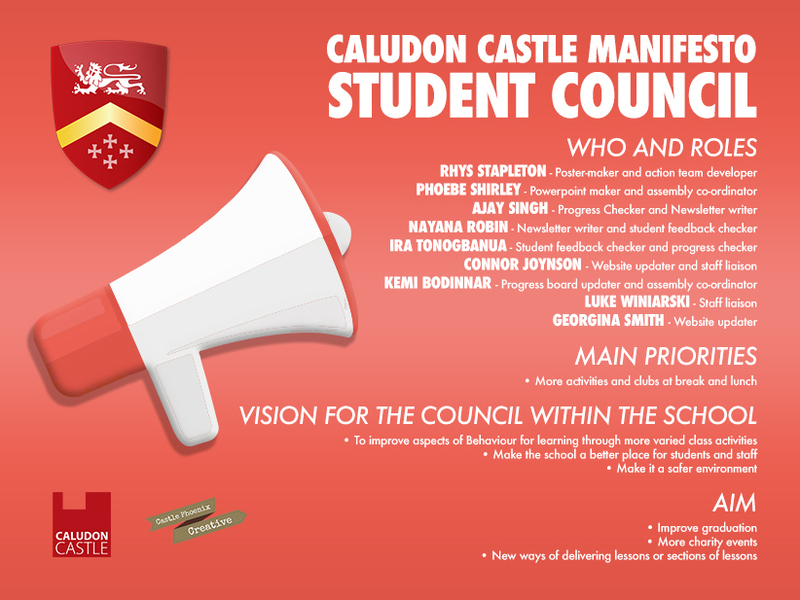 Once in post our student councillors have been busy planning a manifesto for the year ahead (which you can also find on our web page), students have chosen their individual roles within the council, and are continuing to work with a foci on charity and student voice. Within the council students have a distinct role. A timetable of our events can be found on this website. We are proud to have a flourishing and successful council which is continuing to develop towards having a real focus upon student voice and feedback to the students themselves which after all is why the councillors were elected by the students.